(SOLD)Giant Baroque of Bust Douglas Fairbanks as D'Artagnan . 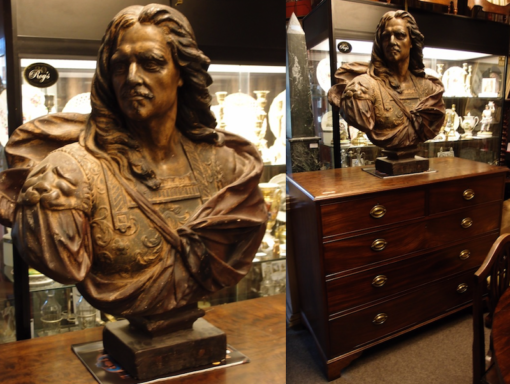 This very large 17th century style bust is plaster with a stone finish. It is 85 cm tall and 76 cm wide. By repute it was made as a prop for the movie The Three Musketeers, the silent blockbuster of 1921. It certainly looks like Douglas Fairbanks as D'Artagnan. I have yet to watch the film all the way through to verify this, although I think I saw it in the 1929 film Iron Mask, which also starred Fairbanks Snr as D'Artagnon. At any rate it is a spectacular piece of interior decoration.